The Cephalopoda is an ancient and very successful group of the Mollusca. Cephalopods have been among the dominant large predators in the ocean at various times in geological history. Two groups of cephalopods exist today: The Nautiloidea with a few species of the pearly nautilus, and the Coleoidea, containing the squids, cuttlefishes, octopods and vampire squids, which is represented by about 700 species. Cephalopods are the most active of the molluscs and some squids rival fishes in their swimming speed. Although there are relatively few species of living cephalopods, they occupy a great variety of habitats in all of the world's oceans. Individual species are often very abundant and provide major targets for marine fisheries. Cephalopods first appeared about 500 million years ago in the Upper Cambrian Period. Although considerable uncertainity still exists, the two extant lineages may have separated 470 mya with the possible origin of the Bactritida or earlier. The long separation of the two lineages has, today, resulted in lineages with cephalopods that are very different in structure. 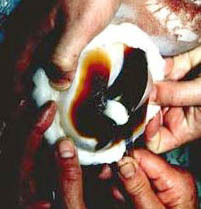 A funnel derived from the molluscan foot (Salvini-Plawen, 1980) or the molluscan neck region (Shigeno et al., 2007). Circumoral arms that are derived from the molluscan head (J.Z. Young, 1965) or the molluscan foot (Shigeno et al., 2007). Figure. Oral view of the buccal mass of the giant squid Architeuthis sp. The dark, chitinous, bird-like beaks are visible on the surface of the white muscle mass. Photograph by Mark Norman. Shell with a phragmocone and siphuncle. Figure. 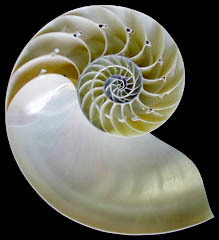 A longitudinal cut through the shell of the pearly nautilus (Nautilus sp. )showing the flotation chambers (phragmocone) and the siphuncle (partially lost from the larger chambers) that passes through the septa separating individual chambers. The shell has become internal and highly modified in most living cephalopods. Photograph by R. Young. Much of the higher classification of Recent cephalopods is unstable. Various authors have suggested highly varying arrangements. We adopt a conservative arrangement that does not differ much from that of Naef (1921-23). Except for the position of the Octopodiformes and its two orders, we have a questionable phylogenetic basis for accepting this or any other scheme. We suggest, however, for the sake of stability, that the following classification be used until this or an alternative arrangement can be derived from cladistic analyses. The analyses, whether molecular or morphological, however, must be robust and must survive considerable scrutiny before changes in classification should be adopted. Nevertheless, we have adopted recent changes in the incirrates octopods (Strugnell et al., 2013) based on extensive data involving both morphology and molecular approaches with emphasis on the latter. Former incirrate octopod families Bolitaenide, Amphitretidae and Vitreledonellidae are now treated as subfamilies within the family Amphitretidae (see Strugnell, et al., 2013). The classification above includes some informal names such as "Architeuthid families" and "Chiroteuthid families" which may prove to be natural groups (i.e., monophyletic groups). Also within the Decapodiformes there are a series of taxa (i.e., Orders) without any indication of their interrelationships. Some taxa cannot even be placed within an order (e.g., Idiosepiidae). These shortcomings, hopefully will soon be overcome with new morphological and molecular evidence. A recent phylogeny by Strugnell et al. 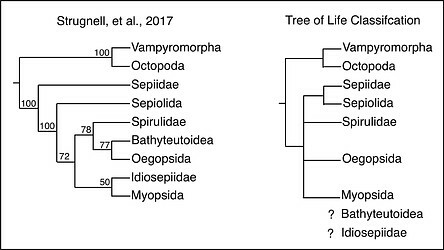 (2017) of the major cephalopod groups based on molecular analyses of mitochondrial genomes indicates the present status of molecular evidence and is seen below and compared to the above classification. Figure. Left - Tree modified from Strugnell et al., 2017. Numbers represent bootstrap values from a Maximum Likelihood analysis, some of which provide high levels of confidence. Right - Tree based on the above Tree-of-Life classification. The phylogeny on the left provides considerably more information on the relationships between the taxa than does the one on the right. Only time and more information will let us know which, if any or all, of the tree nodes on the left can be incorporated into the tree on the right. Salvini-Plawen Lv. 1980. A reconsideration of systematics in the Mollusca (Phylogeny and higher classification). Malacologia 19:249–278. Shigeno, S., T. Sasaki, T. Moritaki, T. Kasugai, M. Vecchione, & K. Agata. 2008. Evolution of the cephalopod head complex by assembly of multiple molluscan body parts: evidence from Nautilus embryonic development. Journal of Morphology 269:1-17. Strugnell, J. M., M. D. Norman, M. Vecchione, M. Guzik and A. L. Allcock. 2013. The ink sac clouds octopod evolutionary history. Hydrobiologia (online, 28 May), 21 pp. Strugnell, J. M., 2017. Whole mitochondrial genome of the Ram’s Horn Squid shines light on the phylogenetic position of the monotypic order Spirulida (Haeckel, 1896). Molecular Phylognetics and Evolution, 109:296-301. Teichert, C. 1988. Main features of cephalopod evolution. p. 11-79. In: (Clarke, M. R. and E. R. Truman, eds.) The Mollusca, 12, Paleontology and Neontology of Cephalopods. Academic Press, Inc., New York. 355 pp. Teichert, C. 1989. Les principales caractéristiques de l'évolution des céphalopodes. In: Mangold, K., Traité de Zoologie V:715-781. Young, J. Z. 1965. The central nervous system of Nautilus. Phil. Trans. Royal Soc., Ser. B. 249 (754): 1-25. Mangold, K. (editor)1989. Céphalopodes. Traité de Zoologie. Anatomie, Systématique, Biologie (P. P. Grassé, editor). Tome 5, Fascicule 4. Masson, Paris, 804 pp. Naef, A. 1921/23. Cephalopoda. Fauna e Flora del Golfo di Napoli. Monograph, no. 35. English translation: A. Mercado (1972). Israel Program for Scientific Translations Ltd., IPST Cat. No. 5110/1,2. Nesis, K. N. 1982. Abridged key to the cephalopod mollusks of the world's ocean. 385+ii pp. Light and Food Industry Publishing House, Moscow. (In Russian.). Translated into English by B. S. Levitov, ed. by L. A. Burgess (1987), Cephalopods of the world. T. F. H. Publications, Neptune City, NJ, 351pp. Young, J. Z. 1971. The Anatomy of the Nervous System of Octopus vulgaris. Claredon Press, Oxford. 690pp. Abbott, J., R. Williamson, and L. Maddock (editors). 1995. Cephalopod Neurobiology. Oxford University Press, New York. 542 pp. Beesley, P.L., Ross, G.J.B. & Wells, A. (eds). 1998. Mollusca: The Southern Synthesis. Fauna of Australia. Vol. 5. CSIRO Publishing: Melbourne, Part A 563 pp., Part B 565-1234 pp. Cephalopods presented in Chapters 11, 12, 13, pages 451–563. Boletzky, S. v. (editor). 1995. Mediterranean Sepiolidae. Bulletin de l'Institut océanographique, Monaco. Special Number 16:105 pp. Boletzky, S.v., P. Fioroni and A. Guerra (Eds.). 1997. Proceedings of the Second international Symposium on Functional Morphology of Cephalopods. Vie Milieu, 47: 87-187. Boucaud-Camou, E. (editor). 1991. La Sieche. The Cuttlefish. Centre de Publications de l'Universite de Caen, France, 358 pp. Boyle, P. R. (editor). 1983. Cephalopod Life Cycles, Volume I, Species Accounts. Academic Press, London, 475 pp. Boyle, P. R. (editor). 1987. Cephalopod Life Cycles, Volume II, Comparative Reviews. Academic Press, London, 441 pp. Boyle, P. R. and G. J. Pierce (editors). 1994. Fishery Biology of Northeast Atlantic Squid. Fisheries Res. 21(1-2):314 pp. Boyle, P. R. (Ed.) 1991. The UFAW handbook on the care and management of cephalopods in the laboratory. Universities Federaton for Animal Welfare, Potters Bar, U.K., 63 pp. Budelmann, B.U., Schipp, R. and Boletzky, S. von. 1997. Cephalopoda In: Microscopic Anatomy of Invertebrates, Volume 6A, Mollusca II (Harrison, F.W., Kohn, A., Eds.) New York: Wiley-Liss, pp 119-414. Clarke, M. R. (editor). 1986. A Handbook for the Identification of Cephalopod Beaks. Clarendon Press, Oxford, U.K. 273 pp. Clarke, M. R., and E. R. Trueman (editors). 1988. The Mollusca. Volume 12. Paleontology and Neontology of Cephalopods. Academic Press, San Diego, 355 pp. Chotiyaputta, C., E. M. C. Hatfield and C. C. Lu (editors). 2005. Cephalopod biology, recruitment and culture. International Cephalopod Symposium and Workshop, 17-21 Feb. 2003. Research Bulletin, Phyuket Marine Biological Center, No. 66, Published by the Center Phuket, Thailand, July 2005, 365 pp. Gilbert, D. L., W. J. Adelman, and J. M. Arnold (editors). 1990. Squid as Experimental Animals. Plenum Press, NY, 516 pp. Hanlon, R. T. (editor). 1988. Life History, Systematics and Zoogeography of Cephalopods in Honor of S. Stillman Berry. Malacologia, 29(1). Hanlon, R. T. And J. B. Messenger. 1996. Cephalopod Behaviour. Cambridge Univ. Press, 232 pp. Hochberg, F.G. 1990. Diseases of Mollusca: Cephalopoda.1.2 Diseases Caused by Protistans and Metazoans. In O. Kinne (Ed. ): Diseases of Marine Animals. Vol. 3.Hamburg: Biologische Anstalt Helgoland, pp. 47-227. Jereb, P., S. Ragonese, And S. Von Boletzky (editors). 1991. Squid Age Determination Using Statoliths. Note Tecniche e Reprints dell'Istituto di Tecnologia della Pesca e del Pescato (Mazara del Vallo, Italy), Special Publication 1:127 pp. Jereb, P. and Roper, C.F.E. (editors). 2005. Cephalopods of the world. An annotated and illustrated catalogue of species known to date. Volume 1. Chambered nautiluses and sepioids (Nautilidae, Sepiidae, Sepiolidae, Sepiadariidae, Idiosepiidae and Spirulidae). FAO Species Catalogue for Fishery Purposes. No. 4, Vol. 1. Rome, FAO. 260 pp. 9 colour plates. Jereb, P., Roper, C.F.E. (eds). 2010. Cephalopods of the world. An annotated and illustrated catalogue of cephalopod species known to date. Volume 2. Myopsid and Oegopsid Squids. FAO Species Catalogue for Fishery Purposes. No. 4, Vol. 2. Rome, FAO. 605 pp. Jereb, P., Roper, C.F.E., Norman, M. S. and J. K. Finn (eds). 2013. Cephalopods of the world. An annotated and illustrated catalogue of cephalopod species known to date. Volume 3. Octopods and Vampire Squids. FAO Species Catalogue for Fishery Purposes. No. 4, Vol. 3. Rome, FAO. 350 pp. 11 color plates. Kinne, O. (Ed.). 1990. Diseases of Marine Animals. Vol. III. (Cephalopoda through Urocordata). Biologische Anstalt Helgoland, Hamburg. pp. 21-227. Koueta, N., J.P. Andrade, S. v. Boletzky. 2006. The cuttle Sepia officinalis. Vie et Milieu - Life & Enironment, 56 (2). Landman, N. H., K. Tanabe and R. A. Davis (editors). 1996. Ammoniod Paleobiology. Plenum Press, NY, 857 pp. Moynihan, M. And A. F. Rodaniche. 1982. The Behavior and Natural History of the Caribbean reef Squid Sepioteuthis sepioidea. Advances in Ethology 25, Supplement 25 to J. Comp. Ethology. Verlag Paul Parey, Berlin. 151 pp. Nixon, M. And J. B. Messenger (editors). 1977. The Biology of Cephalopods. Symp. Zool. Soc. Lond. 38:615 pp. Nixon, M. & Young, J.Z. (2003). The brain and lives of Cephalopods. Oxford University Press, UK, 448 pp. Norman, M.D. 2000. Cephalopods: A world guide. Conch Books, Hackenheim, 320 pp. Northwest Atlantic Fisheries Organization. 1985. Special Session on Squids. NAFO Scientific Council Studies 9:175 pp. Okutani, T., R. K. O'Dor, And T. Kubodera (editors). 1993. Recent Advances in Cephalopod Fisheries Biology. Tokai University Press, Tokyo, 752 pp. Okutani, T. 1995. Cuttlefish and Squids of the World in Color. National Cooperative Association of Squid Processors (Japan). 185 pp. Payne, A.G., D, J. Agnew, G.J. Pierce. 2006. Proceedings of the CEPHSTOCK Cephalopod Assessment Workshop. Fisheries Research, 78 (1):1-106. Pierce, G.J., J.M. Portela, J.-P. Robin (editors). 2005.Environmental effects on cephalopod life history and fisheries. Aquatic Living Resources, 18 (4): 325-400. Pörtner, H. O. and R. K. O'dor (editors). 1994. Lifestyle and Performance in Cephalopods--Physiological Adaptations. Mar. Freshw. Behav. Physiol. 25(1-3):207 pp. commercial Illex species and influences on variability. FAO Fisheries Technical Paper, 376: 273 pp. Rodhouse, P. G., U. Piatkowski, And C. C. Lu (editors). 1994. Southern Ocean Cephalopods: Life Cycles and Populations. Antarctic Sci. 6(2):135-290. Rodhouse, P.G., Yamashiro, C. & Goss, C. (eds.). 2001. Squid fishery biology in the Eastern Pacific coastal upwelling system. Fisheries Research, Special Issue, 54 (1): 143 pp. Roper, C. F. E., C. C. Lu, And F. G. Hochberg (editors). 1983. Biology and Resource Potential of Cephalopods. Mem. Natl. Mus. Victoria 44:311 pp. Roper, C. F. E., and M. Vecchione (editors). 1991. The Gilbert L. Voss Memorial Issue. Bull. Mar. Sci. 49(1-2):670 pp. Saunders, W. B., And N. H. Landman (editors). 1987 . Nautilus. The Biology and Paleobiology of a Living Fossil. Plenum Press, NY. 632 pp. Sweeney, M. J., Roper, C. F. E., Mangold, K. M., Clarke, M. R. & Boletzky, S. v. (editors). 1992. "Larval" and Juvenile Cephalopods: A manual for their identification. Smithson. Contr. Zool. 513:282 pp. Tomiyama, T. and T. Hibiya. Fisheries in Japan, Squid and Cuttlefish. Japan Marine Products Photo Material Association, Tokyo. 161 pp. Voss, N. A., M. Vecchione, R. B. Toll and M. J. Sweeney (editors). 1998. Systematics and biogeography of cephalopods. Smithson. Contr. Zool. Vols. I and II, No. 513: 1-599. Ward, P. D. 1987. Natural History of Nautilus. Allen and Unwin, London. 268 pp. Wells, M. J. 1978. Octopus. Physiology and Behavior of an Advanced Invertebrate. London. Chapman and Hall. Wiedmann, J., And J. Kullmann (editors). 1988. Cephalopods Past and Present. E. Schweizerbart'sche Verlagsbuchhandlung, Stuttgart, Germany, 765 pp. International Directory of Cephalopod Workers. Hoyle, W. E. 1886. Report on the Cephalopoda collected by H.M.S. Challenger during the Years 1873-76. Histioteuthis pacifica Hawaii. (Photograph copyright © 1996, R. E. Young). Cirroteuthis magna (?) off Hawaii (courtesy of Alex Malahoff; photograph copyright © 1996, Hawaii Undersea Research Laboratory). Octopus ornatus, Great Barrier Reef (photograph copyright © 1996, Mark Norman). Argonauta nodosa juvenile, 58 mm shell length, captured off Melbourne (photograph copyright © 1996, David Paul). Sepioloidea lineolata, off south Australia (photograph copyright © 1998, Mark Norman). Iridoteuthis iris, off Hawaii, about 18 mm ML (photograph copyright © 1996, Thomas Burch). The initial Tree-of-Life pages for the Cephalopoda were prepared by R. E. Young, K. M. Mangold and M. Vecchione. Feedback from readers regarding errors, mistakes and omissions, will be appreciated as will suggestions for and contributions of photographs. Page: Tree of Life Cephalopoda Cuvier 1797. Octopods, squids, nautiluses, etc.. Authored by Richard E. Young, Michael Vecchione, and Katharina M. Mangold (1922-2003). The TEXT of this page is licensed under the Creative Commons Attribution-NonCommercial License - Version 3.0. Note that images and other media featured on this page are each governed by their own license, and they may or may not be available for reuse. Click on an image or a media link to access the media data window, which provides the relevant licensing information. For the general terms and conditions of ToL material reuse and redistribution, please see the Tree of Life Copyright Policies.